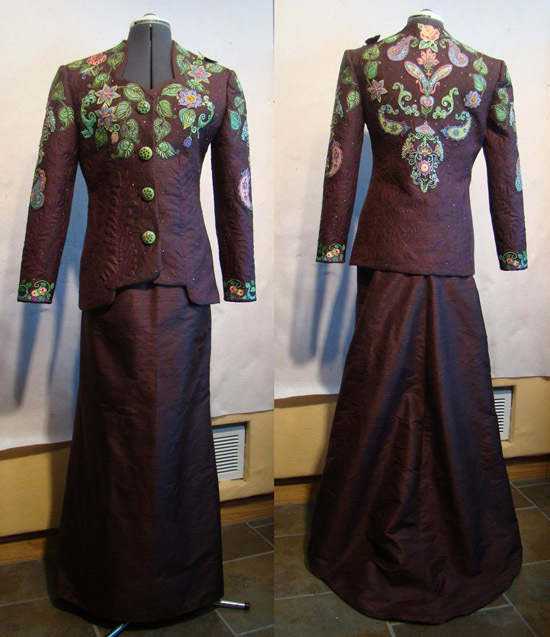 Jenny Raymond, quilt artist, author, speaker, teacher and BERNINA National Artisan describes her “Chocolate Delight” ensemble, which was juried into the 2012 IQA Show. This ensemble was started a year ago but had to be set aside because my Mother dying in Waco, TX. She passed May 25th of last year of Alzheimer’s. I finished this ensemble in her memory. If it hadn’t been for her, I don’t think I’d have come as far as I have in my work. Her sewing skills were simple but precise; she instilled good skills in me, “always press open your seams” for one. I am today because of who she was. Her favorite candy bar was a Hershey with almonds; mine too, like Mama like daughter. Materials: Silk Dupioni, poly silk lining, 100 weight silk YLI thread in two colors (for machine quilting), OESD polyester embroidery thread (for machine embroidery), and embroidery designs from OESD. Hot fix Swarovski crystals, rhinestones and beads. Wool batting from Pellon. Machine Embroidery Applique – This is accomplished by making a sandwich of H20 GONE Water-Soluble Stabilizer with bridal illusion in the center. 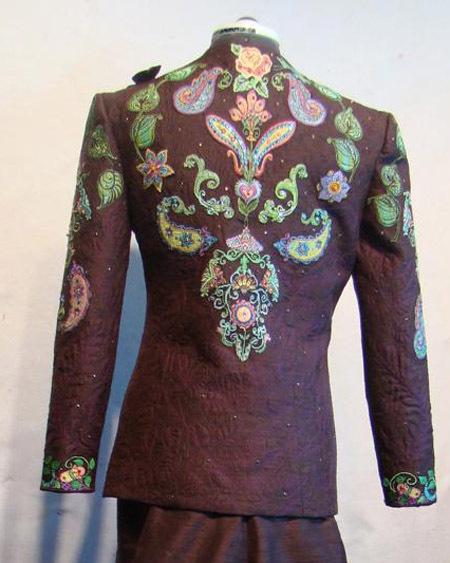 The machine embroidery designs are stitched on the sandwich, then the stabilizer is dissolved and the illusion cut away. Free-motion Quilting – Quilted with 100w silk thread by YLI. I tried something different this time – I used a fuchsia color for the design part of the quilting and then dark brown to match the fabric for the background quilting. 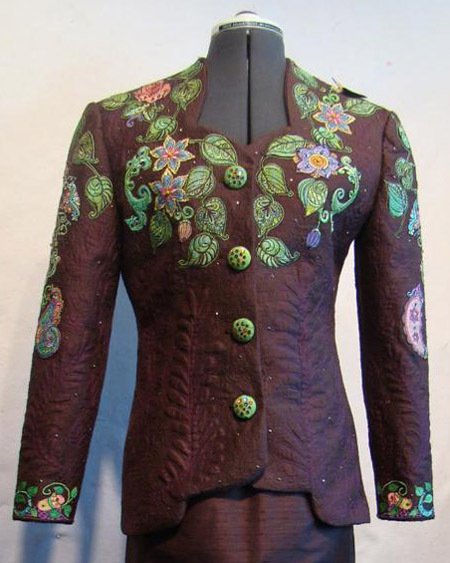 Embroidered Buttons – The buttons were made from a purchased “silk hankie,” which is silk fibers that have been hand dyed. I made a sandwich of cotton fabric, silk “hankie,” and water soluble stabilizer then I stitched over the stabilizer with OESD polyester embroidery thread. After stitching I dissolved the stabilizer, dried the fabric and then cut out circles for covered buttons. Two layers of wool batting were placed between the fabric and the button form. Hot fix Swarovski crystals were applied to the top of the buttons. 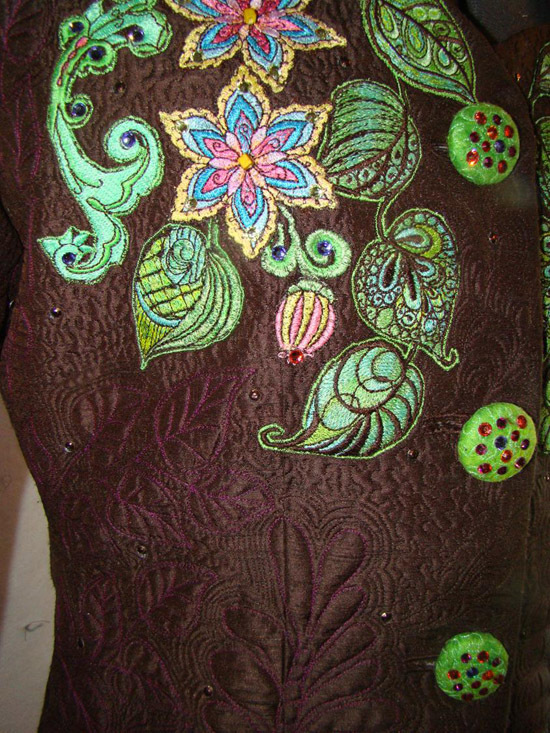 Beading – Beads were hand sewn to the embroidery.